a genus of mites parasitic within the hair follicles of the host, including the species D. folliculo´rum in man, and several other species in domestic and other animals. A genus of minute (0.1-0.4 mm) follicular mites (family Demodicidae) that inhabit the skin and are usually found in the sebaceous glands and hair follicles of mammals, including humans. Some cases of blepharitis in humans have been attributed to Demodex infection; use of facial creams promotes Demodex infection in older women, resulting in facial erythema with follicular scaling. /Dem·o·dex/ (dem´ah-deks) a genus of mites parasitic within the hair follicles of the host, including the species D. folliculo´rum in humans. A genus of minute mites that inhabit the skin and that are usually found in the sebaceous glands and hair follicles. a genus of mites parasitic within the hair follicles of the host; a member of the family Demodicidae. Some of the more common species are: Demodex aries (found in sheep); D. bovis (infests cattle); D. caballi (infests horses); D. canis (infests dogs); D. caprae syn. D. capri (infests goats); D. cati (infests cats), D. criceti (infests hamsters); D. equi (infests horses); D. folliculorum (infests humans); D. ghanensis (infests cattle); D. muscardini (infests dormice); D. ovis (infests sheep); D. phylloides (infests pigs). The simple test for demodex is a skin scrape and microscope examination. Overall, rosacea patients were 9 times more likely to have Demodex mite infestations than healthy controls (odds ratio, 9. The diagnosis of demodecosis is currently only possible via laboratory diagnostics physically locating the genus Demodex mites. Caption: Demodex folliculorum mites, shown in false color, live on human skin, where they've been hitching rides for thousands of years. Demodex gatoi-associated contagious pruritic dermatosis in cats - a report from six households in Finland. Blephadex is used in the treatment of Blepharitis and Demodex mites, while the dissolvable MacuStrip is a supplement for patients with Macular Degeneration. sup] Although tacrolimus has been demonstrated to be useful in the treatment of rosacea, continuous use of tacrolimus can paradoxically induce rosacea-like dermatitis with the question of Demodex infection. A preliminary note on Demodex folliculorum Simon (1842), as a possible vector of leprosy. Normal skin Demodex folliculorum (a head sebaceous follicle lumen mite), usually located at the upper part of the infundibulum of the follicle , has been indirectly involved in rosacea, although a possible causal correlation has not been established up to this day. 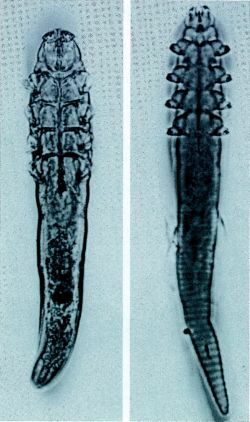 Prevalencia de infeccion por demodex folliculorum en pacientes que acuden a consulta general de oftalmologia. 2) Other causes or correlative factors that have been associated with rosacea are the dysregulation of the cutaneous innate immunity, overgrowth of the Demodex folliculorum mite in the skin, small intestinal bacterial overgrowth (SIB0), Helicobacter pylori infection, and increased vitamin D3 signaling. Demodectic mange is caused by the Demodex mite that lives within the hair follicles.